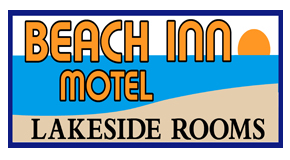 Welcome to Sunset Motel on the Bay & Vacation Home's Munising, MI Attractions information. Along with staying along side Munising Bay and Lake Superior with extraordinary views of the Pictured Rocks area, you will be within minutes of many of our finest Things to See & Do. The Pictured Rocks National Lake-shore is comprised of various formations that create a wall of sandstone cliffs that run for 15 miles along the Lake Superior shoreline. 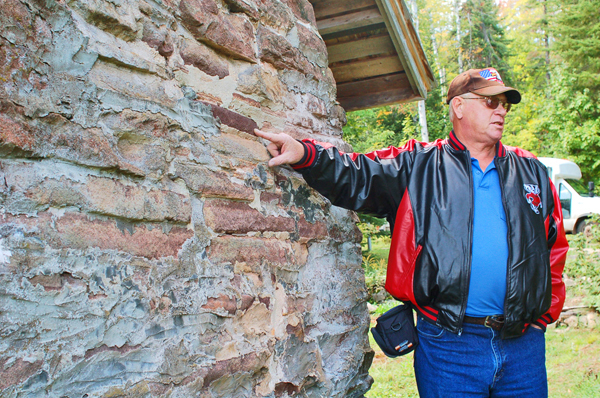 These cliffs range from 50 to 200 feet above the Lake Superior water-table. Minerals that seep out of the sandstone cracks create the world renown "pictures" within the rocks. Munising and Alger County offer 17 wonderful waterfalls to explore. 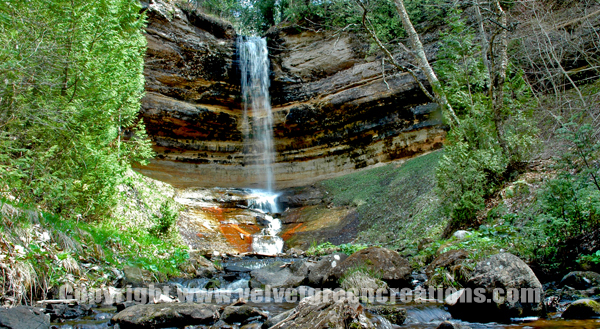 These waterfalls include Munising Falls (shown here), located minutes from Sunset Motel on the Bay & Vacation Homes. Your visit to Munising Falls also includes a short distance hiking trail, educational kiosks and beautiful viewing areas. Other Munising Waterfalls include: Alger Falls, Scott's Falls, Sable Falls, Miner's Beach Falls, Spray Falls, Wagner Falls, Miner's Falls, Memorial Falls, Horseshoe Falls, along with Bridal Veil Falls. Munising gives vacationers a variety of ways to enjoy the Pictured Rocks. 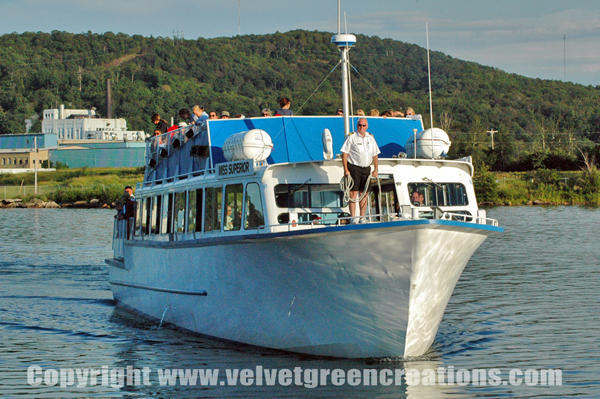 Guests can select a boat tour that fits their needs. 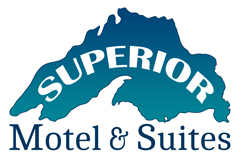 Enjoy your exploration with educational highlights from your captain along with the hospitality that the Upper Peninsula is known for. All of our area tours are family friendly and fun. Plan your adventure here today. 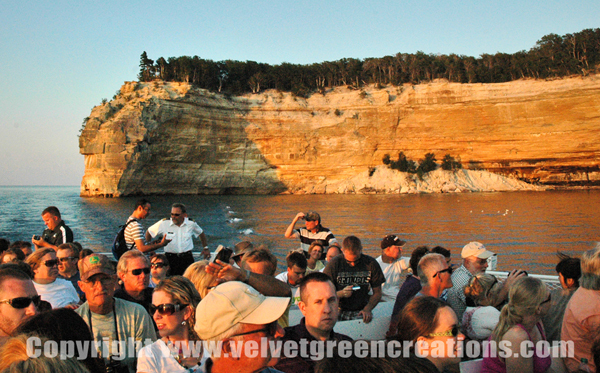 The Pictured Rocks Boat Cruises offer tours throughout the day. 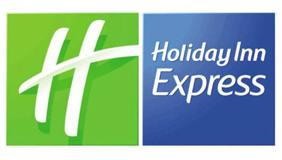 Choose the cruise that fits your needs by visiting their website. Glass Bottom Boat Shipwreck Tours allow guest to view actual shipwrecks within the Alger Underwater Preserve through their glass bottom boats. 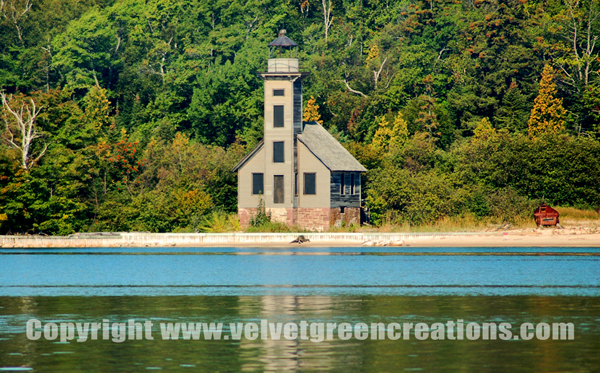 Our Munising Lighthouses are comprised of several historic sites to visit, including the East Channel Lighthouse (shown in photo) that is situated on Grand Island. This view was captured from the Pictured Boat Cruises. The Grand Island National Recreational Area is situated on lake Superior. 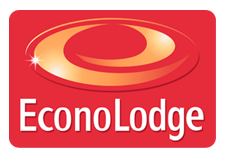 They offer visitors bus tours, biking and hiking. Guests can expected a historical trip back in time with many great highlights. We invite you to visit our Grand Island page with more details. Munising has several beautiful beaches to enjoy with family and friends. 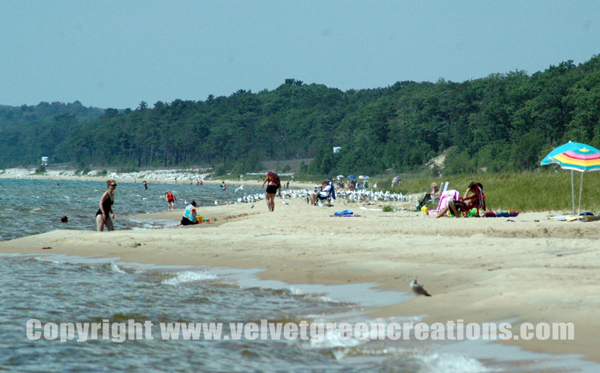 Here visitors enjoy swimming, views of the Pictured Rocks, relaxing and sun bathing. Shown here is the well known Miner's Beach located within 20 minutes of the Sunset Motel on the Bay & Vacation Homes. Area visitors also enjoy the Alger Underwater Diving Preserve that is located on the southern shore of Lake Superior. This is one of the greatest diving areas in the Upper Peninsula. Experience sea caves, interpretive trails along with shipwrecks. The Seney Wildlife Refuge is located 45 minutes away from Munising. It was established in 1935 and covers more than 95,000 acres. Birds, deer, moose, eagles, sand-hill cranes, swans, loons and ducks are just some of the wildlife that will amaze viewers as they hike, bike, walk, drive or canoe through the refuge.